Approx.L 7" x W 5"
Trust us, we get it. You see this skull decoration and instantly feel the desire to grab it while you start reciting Hamlet's "to be or not to be" monologue, right? We mean this in the kindest way possible, but please don't. This skull hates being mistaken for Yorick, the deceased court jester. In fact, he's been known to bite off the fingers of those that taunt him with the over-stated soliloquy. How can a simple Halloween prop dismember anyone, you ask? That is the question, correct? Well, why don't you go right on ahead and place your finger near his movable jaw. See what happens when you mention the name 'Shakespeare' around him. Just don't say we didn't warning ya! 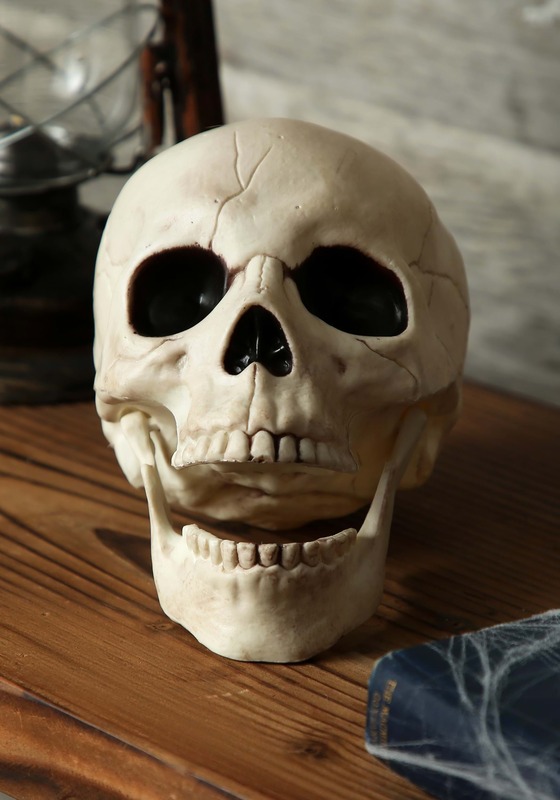 Place this creepy bonehead anywhere around your home to add a hint of creepiness with ease. Take your haunted house to the next level with this spooky skull! Just remember to warn any guests that feel the urge to do their impression of the melancholy and somewhat deranged Prince of Denmark.